The best just got better! 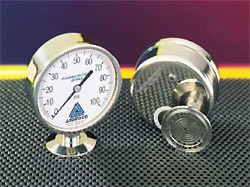 With the newly re-designed 90mm sanitary pressure gauge, Anderson Instruments has again raised the bar relative to performance, reliability, and ease of use. Customers in the Pharmaceutical and Biotech market will recognize at a glance that they’ve maintained all their unique features like all-welded construction, electro-polished wetted parts, and standard calibration certifications. A new, compact profile fits virtually anywhere while still maximizing readability. But what really sets this gauge apart is the new offset adjustment that comes as a standard feature on every Pharmaceutical series gauge. Rear-mounted and unobtrusive, a special tool is provided for the optional span adjustment so it's tamperproof.